1. First section out the front that will make your pompadour or bangs and clip away. 2. Starting from the nape, separate a medium horizontal section from left to right. (The smaller the sections, the more rolls you'll have...though with less volume). 3. 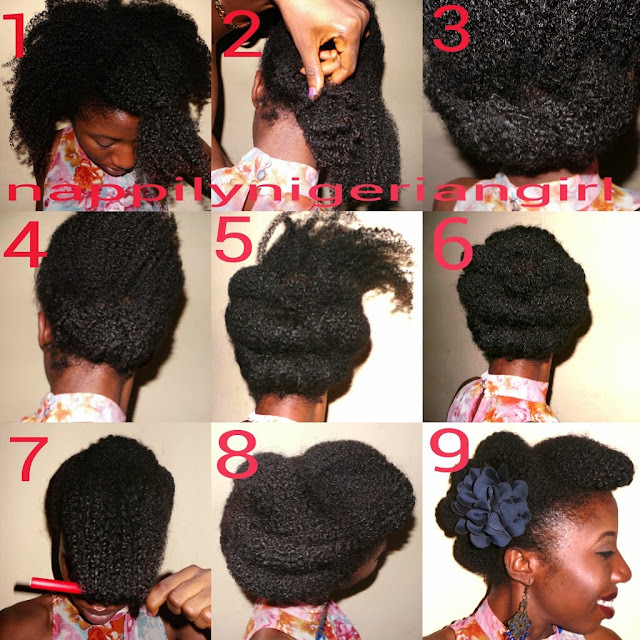 Roll the hair upward loosely from left to right (or right to left depending on which hand you favor). 4. When you get to the end of the roll, use a bobby pin to tuck the end neatly so you ccan't really see it again. 5. Make another horizontal part above the finished one. Roll and pin this section too. 6.When you get to your last section, roll downwards and pin. It will give you smoother results. 7. For your front section, take a medium sized bendy roller and roll your hair inwards and bend the edges to give a nice shape. Adjust your hair to cover the bendy rollers. 8. Smoothen loose hair and edges with gel. 9. Accessorise and you're done! If your hair isn't long enough to wrap around the rollers, here's another way to style your front section. 1. Divide your front section into to two. Take the end of the right section (pink) and pin under the left section (pink point), then take the left section (blue) and pin under the right pat (blue point). 2. Make your adjustments and voila! Your style is beautiful. I will definitely try it out.